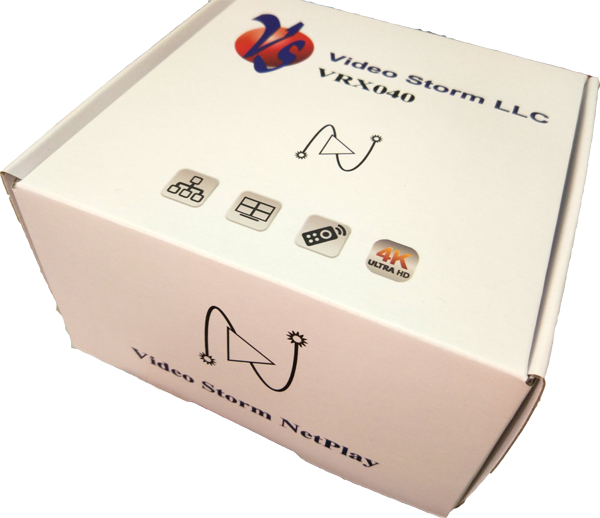 VRX040 is the Video Storm 4K NetPlay Pro decoder solution optimized for commercial environments. 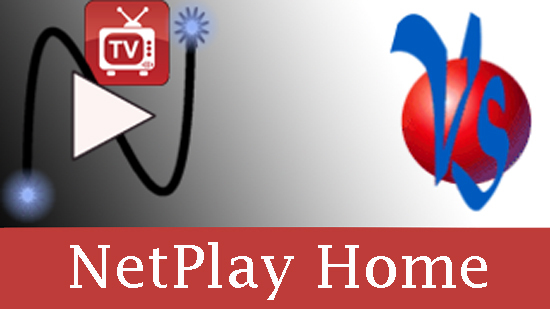 NetPlay Pro allows you to distribute live protected HDMI content across your standard Ethernet network. This next generation technology will completely replace HDMI matrix switching, delivering new features, flexibility, scalability, and an integrated user experience. FREE Control4, RTI, and Savant drivers. 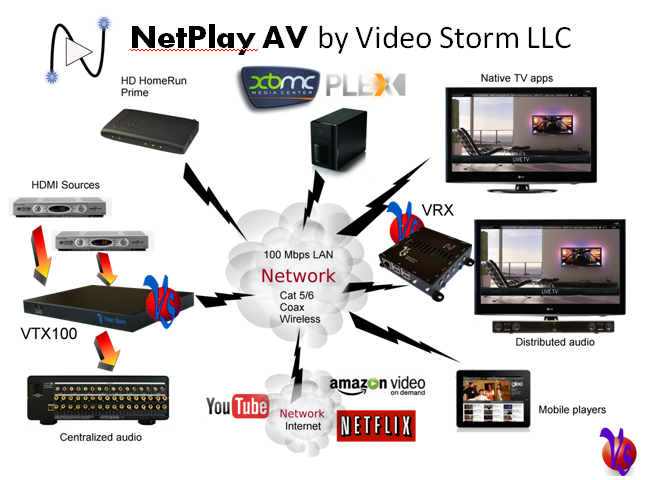 Video Storm Netplay Video Pro is the ultimate solution for your commercial installations to include video wall, signage, and tiling. Please see our NetPlay Pro Commercial page to quote your systems today! 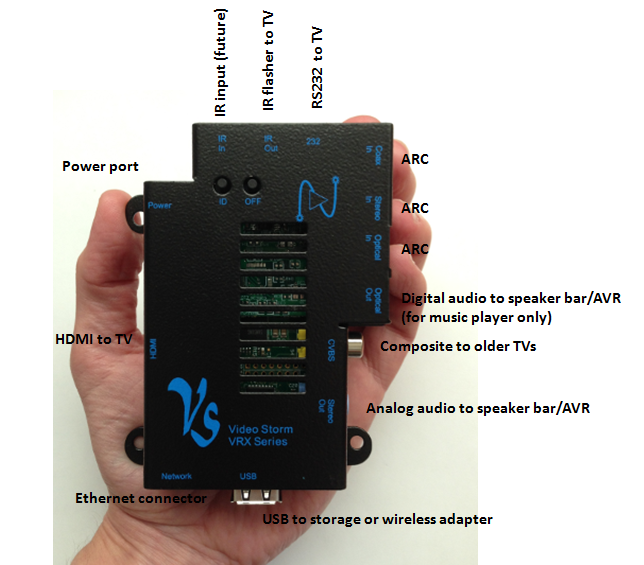 VRX040 is the receiver units that mounts on the back of the TV. 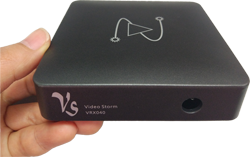 One VRX040 is used for each TV in your system. Fully sychronized customizable video wall support (up to 36 displays). Not yet supported. Ethernet control features allow external control of NetPlay matrix, your TV, and VRX040 by supported control systems or mobile apps. Full integration in Control4 and RTI. NetPlay software can be updated directly from NetPlay Manager. No need to connect to Google Play! Plug in, power up, and ID it with NetPlay Manager. It is that simple! VRX040 features a two USB host ports for expandability. Supported modules include wireless remotes & keyboards, external storage, and IRUSB. Small enough to easily mount behind TV: 4" x 4" x 1"
All VRX040 NetPlay licenses are tied to the NetPlay Manager (NVMM) hardware in your system. When you receive NetPlay Manager, please complete the software registration in order to bind your new NetPlay licenses to your NetPlay Manager. Licenses may be transferred between NetPlay Manager hardwares. In the case of hardware failure inside the warranty period, there is no charge for this service. In other cases, there is a small charge for this service. In all cases, the NetPlay Manager hardware you are transferring from must be surrendered to Video Storm LLC. For each system, purchase a NetPlay Manager (NVMM). In conjunction, you need to purchase VRX040s corresponding to this device in the same online purchase order. A single order of NVMM and VRX040 cannot be split between multiple systems. If you are just adding more VRX040 to an existing system, you can purchase the additional hardware for the same system in a single new order.